The machine is the single most defining entity of the twentieth century. Its role at the turn of the century was a central one: it was the dawn of the modern age facilitated by the energy and productivity of the machine. The focus of life shifted from the rural to the urban, from day to night. This shift in experience precipitated a new way of seeing the world, and for a time it must have felt like anything was possible. Looking at visual art from the beginning of the twentieth century, this experience is illustrated through innovation in representation. The fragmenting and re-construction of the visual world in art was a response to seeing the world in a different way. Through the window of a speeding train or from a vantage point in a building towering above the land, new perspectives on the world were made possible by technological innovation. Throughout the twentieth century perceptions of the machine’s role in society changed. So inevitably, the content of this machine inspired art changed throughout the century. Taking the above as a premise, this essay will consider the commentary, through visual art, on the influence of the cult of the machine and machine aesthetic on twentieth century art and culture. The investigation will start at the early responses to the cult of machine, and examine the changing role of the machine aesthetic and the impact of mass production on the image. By 1913 the machine had been in existence in everyday life for a century. It had been the founder and securer of the modern age, drawing countries together in support and insuring human survival. Life in the nineteenth century could be seen to be lived in the present; experience ran from day to day. Gradually life was taken for granted. The sense of experience illustrated in art of the Futurist movement is a development of this sense of security, exhibiting the feeling of rapid progression to a state where experience itself could be surpassed. This was, according to the Futurists, an aspiration which could be realised through the machine. Giacomo Balla’sDynamism of a Dog on a Leash, 1912, [Fig. 1] shows the implications of this new vision for the world in an unusual rendering of speed through the natural bodies of a dog and human. Turners’ Rain, Steam and Speed – The Great Western Railway from c.1844 [Fig. 2], suggests the speed of a train by its misty composition. The viewer is also made aware of the almost alien quality of the machine, through the heavy iron trajectory of the rail-bridge, which propels the machine forward, while providing contrast with the barely visible older bridge that appears on the left hand side. 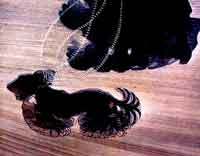 The same sense of rush and energy is suggested here in Balla’s painting by applying the elements of the train’s dynamism to the dog and its walker. They appear in a machine-like black, propelled by some relentless power, which retains the mystery and significance of Turners’ steam train. Balla’s painting seems to sum up the notion that the machine has had an irrepressible affect on humanity and the natural world, and there is no longer the need to express that through representation of the technology itself. The aspect of transport is reflected as an intrinsic part in the removal of man’s perception of himself, in terms of the artists’ recommendations through art. Antonio Sant’ Elia’s design for the New City in 1914 [Fig. 3 ]remains today, a startling vision of the imagined future. His premise was that this architecture for this building must have absolutely no reference to any style that had gone before, reflecting the state of mind of the futurists. Filippo Tommaso Marinetti’s founding statements in the Futurist Manifesto of 1913 expounded his belief that the body and its needs should shape its environment, that the emphasis must be on convenience and comfort, so that man could achieve a state of imperceptibility. He therefore favoured architecture which was suitable for all, and modes of transport that extended the function of these spaces, intermediately. The New City supports this idea, comprising a residential tower which is fed into by a rail tunnel, an automobile bridge and an aircraft landing pad. There is no green space or indeed any sign of accessibility by foot . The denial of natural needs feeds into the wider experience of the city. The innovations in technology allowed for greater numbers of power stations to be built, supplying the city with more light and enabling urban activities to continue in the darkness of the night. From a Futurist viewpoint, the need to sleep was replaced by light in the same way that the need to exercise was removed by the car and the train. The implication was that man should be more machine like and even though the recommendations in the successive manifestos and the designs for New City did not strictly translate into everyday life, their influences on European art were far reaching. European designers took the machine aesthetic in the creation of mass produced objects which began to appear in the shops and homes of cities. In 1925, Paris hosted the Exposition Internationale des Arts Decoratifs et Industriel Modernes. The effect of the machine in society had been to draw attention to human creativity, in the variety of new viewpoints experienced through modern technology. The Exposition celebrated the icons of the mechanised world. Connoisseurs disliked the borrowing of aesthetics of machine iconography in to mass culture, believing this act distracted from their true meaning . Through this debate, we have an example of the changing meaning of machine inspired art. While the Futurist and Constructivist movements applied the allegorical qualities of machine to the human, there was now a focus on the abstract qualities of its aesthetic, lending the formal elements of the machine to art objects which were mass produced and sold as luxury objects in department stores.